Pencil pouch is designed to keep the pencils safe and carry them anywhere. It is featured with a zip for easy opening and closing of the pouch. Jute zipped pencil pouch is now a day high in demand due to high utility and beauty. Zipped pencil pouch designed from jute is considered as the green option to store the pencils systematically. As jute is eco friendly in nature, jute zipped pencil pouch designed from it is also environment friendly item. Using eco friendly products has become the necessity of the hour to save the environment and nature. Besides being environment friendly, a jute zippered pencil pouch is also bio degradable in nature. It is decomposed naturally without creating any pollution. This highly useful item is designed in varied attractive styles, patterns and colors. As per the needs of the user, it is available in natural and earthy tone as well as varied enticing colors. It is treated, bleached or dyed in various colors to give it a breath taking appearance. In addition to this, jute zipped pencil pouch can be availed in simple patterns as well as embellished with varied materials. Stones, gems, mirrors, laces, crochet work, patch work, embroidery, painting and different types of embellishments are done on it to enhance its natural beauty. Its light weight and compact nature make these jute zipped pencil pouch ideal to be carried anywhere even by kids. Highly strong and sturdy, it is reckoned in the market for long life without any abrasion. 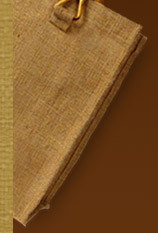 Jute that is one of the strongest materials adds durability and resistance capability to it. Jute zippered pencil pouch is resistant to heat, fire, water as well any other kind of wear & tear. Its coarse texture allows it to be used for rough and tough usage. 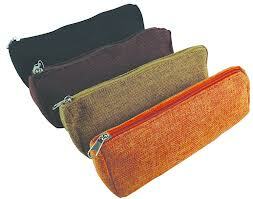 Quality, beauty and utility all have come up with zipped pencil pouch of jute at affordable prices.